Adele, near Rethymnon, takes you to the north coast of the Greek Island of Crete. This quiet little town is located close to the soft golden sands of the coastline and offers a pretty beach, as well as a historic town where visitors can immerse themselves in the more tranquil side of the island. There is a small selection of shops, restaurants and bars, while lively Rethymnon is just a 15 minute drive away. Take day trips to Rethymon where you will find a further selection of bars, restaurants and shops. Pick up trinkets and souvenirs, as well as shopping for fashion and local produce, including olive oil, wine and more. The old town features historic architecture combining traditional Venetian designs, as well as Moorish mosques and more. The large sandy beach offers plenty of space for everyone, and there are water sports and activities available as well. Holidays in Adele near Rethymon offer you a chance to explore some of the island’s history, with a tranquil location close to the island’s larger towns. Spend days on the beautiful sandy beach simply relaxing with a book and taking a cooling dip in the water. When it comes to hotels there are plenty of luxury options, while the natural surrounding landscapes give you the chance to explore on foot or by bicycle. Book your luxury holiday in Adele with Sovereign and we’ll help you find the ideal hotel. All of our bookings come with selected airport lounges and private transfers, so you can just sit back and enjoy the ride. 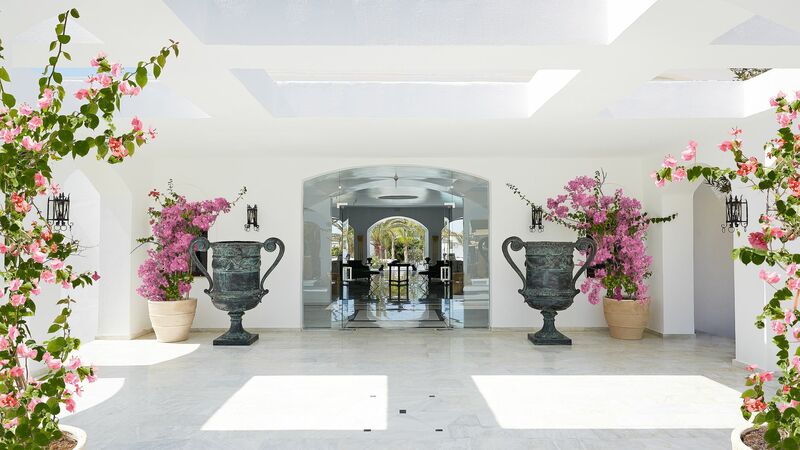 Choose Grecotel Caramel Boutique where you’ll find typical whitewashed Greek architecture accentuated by luscious gardens with bright flowers. When it comes to dining you can enjoy the freshest local cuisine, including ingredients picked from the hotel’s own gardens. As well as being close to Rethymnon, Adele is only an hour from Chania. It's previously been occupied by the Arabs, Venetians and Ottomans, and all three have left behind an amazing architectural legacy. See the best of it in the old town, which also has some great bars and restaurants. Transfer time from Heraklion airport to Adele is just over an hour.